Maybe you have heard the term in-home care before, but were never really sure what is involved or included with this type of elderly care. If you have been wondering lately about the quality of life that your parents are enjoying in their home, and how you can take care of them without quitting your job, then this article is for you. Perennial Angels Homecare wants to raise the standard of care for the elderly in the Atlanta metro area, which is why we proudly offer quality care at an affordable price. Call us to learn how we can help you care for your parents. Personal Care – Do they need assistance with using the restroom, bathing, dressing themselves, personal grooming, or eating? Household Care – Do they require help with performing tasks such as laundry, cooking meals, cleaning their house, or running errands such as grocery shopping? Health Care – Would they benefit from having someone help with driving them to doctor appointments, or physical therapy appointments? Emotional Care – Do they seem to be struggling with feelings of isolation and loneliness? Would a companion provide much-needed conversation and interaction? If you found yourself saying yes to a number of these DLAs, then you should consider hiring an in-home caregiver. In-home care might seem like a number of simple tasks, but when viewed through the lens of an aging parent, you can see how quickly they become challenging jobs. The qualified caregivers at Perennial Angels Homecare want to help you provide the love and care that your parents so richly deserve. Call today to discuss how we can help your parents. While your loved ones may not at first be open to the idea of having someone in their home, we believe that if you discuss some of these benefits with them, they will be more open to having this much-needed conversation. Caregivers have a variety of skills – Perennial Home Angels will work with you and your parents to match their needs with the skills of their in-home caregiver. We know that a big factor in meeting a client’s needs is providing a caregiver who not only serves their needs, but is also someone that they can easily bond with. Flexibility – Your loved one might have a very predictable schedule of when they need help each week. We have found, however, that predictability is not always a common factor in elder care. Our caregivers can work with your needs to make sure that they are available when your loved one needs their help. Dependability – When our caregivers need to miss a day due to illness or another reason, we will make sure that your loved one doesn’t miss out on the care they need and expect. We will provide an alternate caregiver to take care of your loved ones on the rare occasions that the primary caregiver is unable to be at their home. 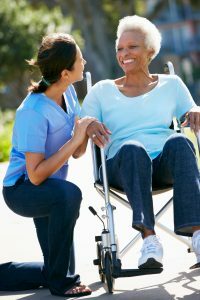 In-home care essentially provides the level of assistance that your parent or loved one needs in order to maintain their independence in the comfort of their own home. At Perennial Angels Homecare in Atlanta, we take pride in offering quality service at an affordable price. Call today to discover the difference we make in the lives of seniors.